Thanks to a posting on his Official Facebook Page, the legendary hero of your childhood, Jason David Frank, will be attending a number of shows for 2014! Among one of his stops is one of the fastest growing and popular shows – Denver Comic Con! 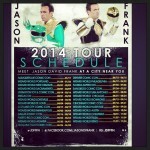 Jason David Frank will join Walter Jones (the Mighty Morphin Black Ranger) and David Yost (the Mighty Morphin Blue Ranger) as the first tokusatsu related guests at the third annual Denver Comic Con June 13th-15th 2014. For those who don’t remember off the top of your head who Jason David Frank is – he played the Mighty Morphin Green Ranger, Mighty Morphin White Ranger, Zeo Red Ranger, Turbo Red Ranger, Dino Thunder Black Ranger, and is set to reprise his Mighty Morphin Power Rangers roles in the 2014 series Power Rangers Super Megaforce in a special episode. But now for some sad news – based on the scheduled date for Wizard World Chicago, it would appear that Jason David Frank will NOT be attending 2014’s Power Morphicon convention (the official Power Rangers convention). Power Morphicon takes place August 22nd-24th 2014, and Wizard World Chicago takes place August 21st-24th 2014. Jason is currently scheduled as a guest at Wizard World Chicago for their 2014 show and the dates conflict. If you live in the middle United States and would like to experience a great show, be sure to register for Denver Comic Con as tickets are going fast. TokuNation will be in attendance at the show to bring you pictures and any news that comes up at the show. There has been no official announcement from Denver Comic Con regarding Jason David Frank’s attendance, nor is there any update from Power Morphicon on whether or not the iconic Power Ranger is or is not attending the official convention. As soon as there is we will bring the news to you.